TetraSki provides independent turning and speed variability through the use of a joystick and/or breath control. The TetraSki is ideal for individuals with even the most complex physical disabilities, allowing the skier to operate the TetraSki safely, with a high degree of performance and independence. After three years of development by the University of Utah Rehabilitation research and development team, three TetraSkis will be provided to nine national adaptive ski program partners for shared use during the 2018/2019 ski season and include comprehensive and mandatory training for instructors and participants. 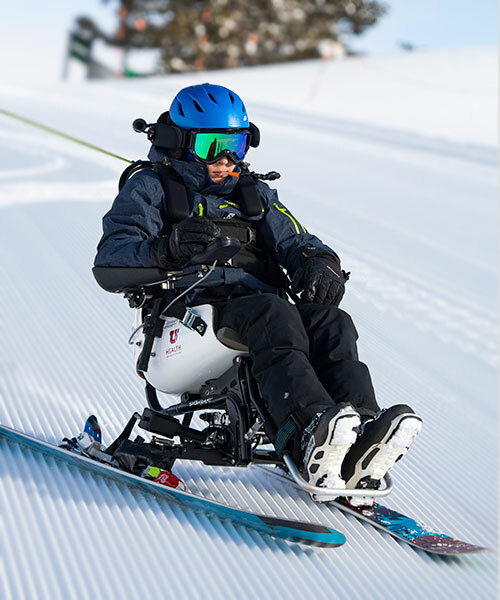 The TetraSki truly represents a paradigm shift in the understanding of how individuals with complex disabilities can have access to and utilize high performance ski equipment. The TetraSki is a modified version of the Tessier Snow’Kart, which features electric-powered actuators on each ski and both a joystick and mouth-controlled system for independent control of turning and speed. A tether — to the instructor — is used as an emergency brake but is not used for turning directions. A wireless remote offers TetraSki instructors a safe way to demonstrate proper skiing technique. The TetraSki offers an unbelievable level of independent control over a wide variety of terrain. 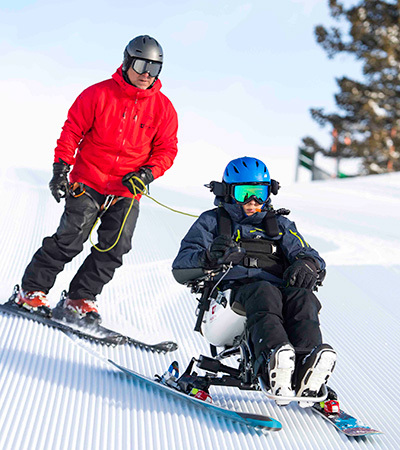 This technology — tested extensively through the University of Utah adaptive ski program (TRAILS) — has replaced the traditional, tethered bi-ski approach in the TRAILS program for individuals with high spinal cord injury and for other diagnoses with significant upper extremity impairments or asymmetry. A TetraSki computer simulator also has been developed to dial-in customized control settings that can be exported and used with the actual TetraSki. The TetraSki offers beginner and advanced modes for frustration-free learning and to unlock higher performance when desired. Hover over images for TetraSki details. TetraSki photos by Lee Cohen. + May I purchase the TetraSki? . . . While we currently are not offering the TetraSki for private purchase, we are leasing three skis to adaptive programs across the country for the 2018-19 season. The amount of time the programs have the ski is based on number of clients that the program has identified. The TetraSki is still evolving and our current program of providing the ski to adaptive organization gives us greater control over hardware/software upgrades, feature additions, and, if necessary, repair work. If you’re interested in trying the TetraSki but don’t have a participating program nearby, consider contacting an adaptive program near you and encouraging them to contact us to apply for the TetraSki. You may also see a calendar of participating programs hosting a TetraSki this winter. + What safety concerns should I be aware of with the TetraSki? . . .
As with any sport, and especially with downhill skiing, there are inherent risks involved. These risks can be minimized through a combination of good judgement, proper instruction and correct equipment setup. Every instructor that oversees and runs the TetraSki lessons has undergone extensive training with the equipment and is there to help guide you through a safe, fun skiing experience that challenges you while also minimizing any chance of an accident. That said, we recommend individuals with traumatic injuries should always consult their physician before trying out the TetraSki. + Is the TetraSki only for those with a spinal cord injury? . . .
+ What is the cost and how does our program apply to lease the ski? . . . While our program list for the 2018-2019 season has been finalized, we will continue to build more skis and expand our national and international coverage. This season, we are fortunate to be able to lease the ski free of charge to participating programs, thanks to a grant from the Craig H. Neilsen Foundation that completely covers the costs of ski training and transportaton. We are hoping to continue to support additional skis and subsidize opportunities in the future. To apply for a TetraSki for 2019-2020, Contact Us. + Is the TetraSki compatible with our ski resort's chairlift, gondola or tram system? . . . The TetraSki is compatible with most chairlifts. Typically if a traditional mono-ski/bi-ski can access the chairlifts, the TetraSki should be compatible as well. While a safety bar is recommended (and may be required depending on your local regulations), the TetraSki features a rear restraint system that secures the device to the chairlift backrest. The Tetraski should fit on any tram or gondola with a door opening greater than 36 inches. Surface lifts such as T-Bars/Poma lifts, or tow ropes, represent unique challenges. Please contact us for more information about your specific lift. If you have any questions about equipment compatibility with your ski area’s lift infrastructure, contact us with basic dimensions and descriptions and we can make a recommendation. + What terrain is most appropriate to use the ski? . . . The TetraSki does great on the majority of green and blue ski runs (beginner and intermediate terrain). However, it is not limited to traditional runs and has been used off-piste with great success. Terrain selection is often dictated by current snow conditions. + What types of skis work on the TetraSki? . . . Designers and engineers have worked hard on identifying particular skis and binding position placement that is optimized for the TetraSki. While most alpine skis technically work on the TetraSki, we suggest the use of skis provided by our program. + How does instructor training work and who can do it? . . .
All TetraSki instructors must attend a four-day mandatory trying course in Utah. The course is designed for advanced/expert instructors who already have familiarity with tethering adaptive ski devices. + Our program is currently using the TetraSki. Can we provide feedback and feature requests? . . . Yes. TetraSki development is ongoing and we are always looking for feedback! To request features or improvements, as well as troubleshoot equipment problems or order spare parts, Contact Us. + What happens if the TetraSki needs to be adjusted or fixed? . . . If you are a program currently leasing the TetraSki, we have staff available for phone suppor. If needed, we are ready to send replacement parts, including mailing the parts overnight so as not to delay use for participants. + Where can I try the TetraSki?. . .
We are strategically partnering with adaptive ski programs throughout the United States starting in the winter of 2018-2019 to offer the TetraSki to participants. These programs have been selected to cover a large portion of the U.S. skiing population, including regions in the Northeast, Midwest, Colorado, Utah and California. + How are you able to financially support this program? Can I support you? . . .
We are fortunate to currently have a supportive environment that is pro-innovation that affords our team the time and focus to design and build the technology. We have multiple partners and have received internal and external grants, including support in 2015 from the Craig T. Neilsen Foundation that facilitated the launch of the Tetradapt Initiative. Are you a nonprofit organization or program that offers adaptive recreational and sports opportunities to people living with spinal cord injuries or disease? Are you looking to provide your community with state-of-the-art ski technology? Tetradapt Community is happy to work with you on providing the TetraSki to your program, along with the mandatory training for your instructors and clients. Let us know a little more about your organization, including the clients/members you serve and how you'd like to utilize the TetraSki in your program.